With painstaking thoroughness, Ven. Analayo marshals the suttas of the Pali canon, works of modem scholarship, and the teachings of present-day meditation masters to make the rich implications of the Satipatthana Sutta, so concise in the original, clear to contemporary students of the Dharma. Unlike other popular books on the subject, he is not out to establish the exclusive validity of one particular system of meditation as against other's. Rather, his aim is to explore the sutta as a wide-ranging and multi-faceted source of guidance which allows for alternative interpretations and approaches to practice. His analysis combines the detached objectivity of the academic scholar with the engaged concern of the practitioner for whom meditation is a way of life rather than just a subject of study. The book should prove to be of value both to scholars of Early Buddhism and to serious meditators alike. Ideally, it will encourage in both types of readers the same wholesome synthesis of scholarship and practice that underlies the author's own treatment of his subject. 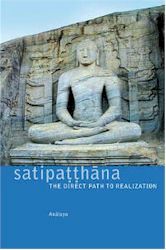 ... an indispensable guide ... surely destined to become the classic commentary on the Satipatthana.